Paradigma (Graece παράδειγμα 'exemplar, exemplum, documentum') in scientia et epistemologia (theoria scientiae) est distincta notionum copia vel exemplar cogitationis, cuius proprietates sunt theoriae, modi investigandi, postulata, et normae rerum quae legitimae disciplinae contributiones sint. 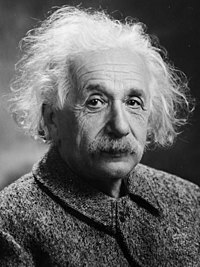 Albertus Einstein, auctor unius ex principalibus paradigmatum mutationum scientificarum saeculi vicensimi. Clarke, Thomas, et Stewart Clegg, eds. 2000. Changing Paradigms. Londinii: HarperCollins. ISBN 0006387314. Dogan, Mattei. 2001. Paradigms in the Social Sciences. In International Encyclopedia of the Social and Behavioral Sciences 16. Encyclopædia Britannica. 2003. University of Chicago. ISBN 0852299613. Hammersley, Michael. 1992. Review: The Paradigm Wars: Reports from the Front. British Journal of Sociology of Education 13(1):131–143. JSTOR. Handa, M. L. 1986. Peace Paradigm: Transcending Liberal and Marxian Paradigms. Commentarius in International Symposium on Science, Technology and Development oblatus. Dellii, 20–25 Martii 1987. Mimeogramma apud O.I.S.E., University of Toronto, Canada, 1986. Harris, Matthew Edward. 2010. The Notion of Papal Monarchy in the Thirteenth Century: The Idea of Paradigm in Church History. Lampeter et Lewiston Novi Eboraci: Edwin Mellen Press. ISBN 9780773414419. Kuhn, Thomas S. 1996. The Structure of Scientific Revolutions. Ed. 3a. Sicagi et Londinii: University of Chicago Press. ISBN 0226458083. Masterman, Margaret. 1970. The Nature of a Paradigm. In Criticism and the Growth of Knowledge, ed. Imre Lakatos et Alan Musgrave, 59–89. Cantabrigiae: Cambridge University Press. ISBN 0521096235. Popper, Karl. 1934. Logik der Forschung. ISBN 0415278449. Novissima mutatio die 29 Martii 2019 hora 05:40 facta.